Phuket is a beach destination in Thailand renowned for its sun and sea. In Phuket Town, discover unique Sino-Portuguese architecture, Thai culture and local markets. Shopping and nightlife activities are also available for tourists. Located 862 kilometres south of Bangkok, Phuket is Thailand's largest island. Dubbed the "Pearl of Andaman", Phuket is a tropical paradise and offers some of the finest resort accommodation imaginable. Phuket is a beach destination in Thailand renowned for its sun and sea. In Phuket Town, discover unique Sino-Portuguese architecture, Thai culture and local markets. Shopping and nightlife activities are also available for tourists. 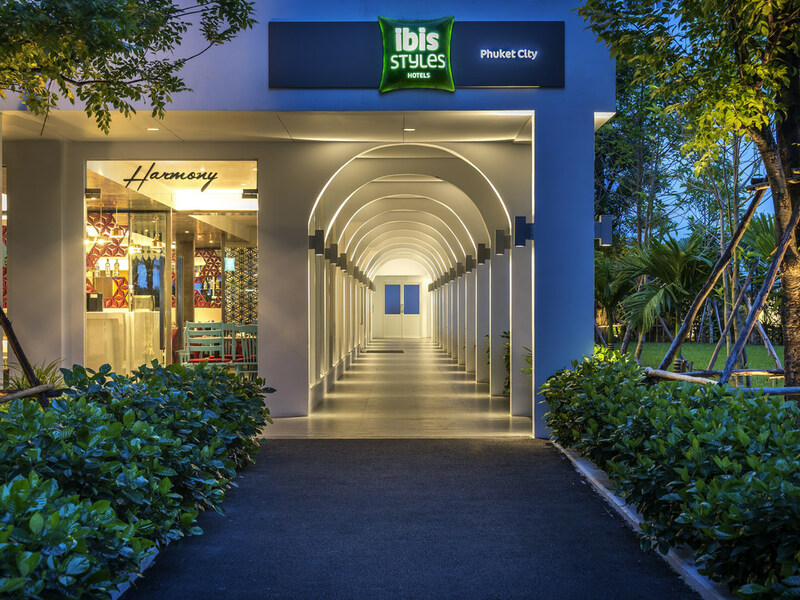 The trendy ibis Styles Phuket City is near the historical Sino-Portuguese quarter, local markets and nightlife. It is only 10mins away from the natural park & the sea, with shuttles to the beach and Patong available at a low fare. The modern rooms feature essential amenities such as LCD TV with international channels, tea and coffee making facilities, fridge, hairdryer, work desk, cabinet, safe and free WIFI. Our family rooms are perfect for families travelling with kids. The lobby bar serves light snacks and a wide selection of beverages. Open daily from 10 AM to 11:30 PM. Prefect location, so close to old town , wet market just in front the hotel . If want go to beach need take taxi or grab . The service are wonderful, except for the the 1st day breakfast. The housekeeping at the hotel was outstanding. Bravo to all the staff that work at the hotel. Looking forward to staying with you again. Well equipped and spacious room compares to other Ibis, close to main sightseeing places. Not various choices of breakfast. A small request couldn't be provided. Well after arriving the check in process was a bit slow. Nothing for a Gold loyalty member. I informed of my arrival at the hotel at 11pm and requested to have the air condition be switched on at least an hour before my arrival. My request was acknowledged by the hotel's email and nothing was done about it. Just a small request for a loyalty customer couldn't be met ! It's a big disappointment! It was joyful to stay in ibis style hotel Phuket, I really enjoyed,specially three counter girls who served me whole heartedly n solve my tour guide problem which she (Laila) was giving me bad time, I already recommended my friends to ibis style Phuket hotel. The frontdesk people was very nice, she wanted to help us. We arrived 8am and she gave us a late check out because we were only staying one night. The room was very nice and clean! The breakfast was very good as well. The room is clean but small. There are 2 windows with no view. The bathroom door handle was broken, no flipflops to wear in the room. Breakfast is average, limited selection of food. The room size just cozy for smaller size travelers. Room was clean. All essential facilities are available. Wifi is fast. Front desk staffs are friendly and helpful. Everything was great and the staff was very professional and even provided breakfast at odd hours! The dining menu was limited though. Although the room size a bit smaller but it is cozy for smaller sizes travelers like us. All essential room facilities are available. Wifi was in good connectivity quality. Front desk staffs are friendly and helpful. Overall it is a pleasant stay. Beautiful hotel, friendly staff, love the self check in. I had an amazing time. Nice room, very clean, lovely breakfast, convenient location. FRIENDLY RECEPTIONIST. REQUESTED FOR LATE CHECK OUT IN THE VERY LAST MINUTE AND THEY GLADLY TO ASSISTS WITH A SMALL FEE. ROOM WERE SMALL BUT WELL EQUIP AND CLEAN. SHOWER ROOM ONLY PROVIDE A MULTI PURPOSE SHAMPOO WHICH WAS A DRAWBACK. Beautiful hotel. Easy check in great location. Wonderful facilities. Highly recommend! Nice, clean hotel. Good breakfast. The room AC was either too cold or too warm, blowing pretty strong. Good location at city center. Got room upgraded and we’re satisfy. It’s spacious and equipped with complete amenities, less variety on breastfast but overall is ok, have to ask for a welcome drink VC from staff. Service is good and quick. Special thank to guard at hotel entrance. He’s helped us with our luggages. Very appreciate. This is a good designed hotel. I really like it. Nice staff, terrible coffee, aircon very loud, terrible view. Good rooms. Location is nice.